Although many new year's resolutions tend to revolve around downsizing their booze habits, HOFWs made no such arrangement. So as not to appear to have fallen victim to this cliche, I went out Saturday for an early evening tasting followed by wine bar and wine dinner. I joined the Flying Winemaker for their monthly Top 12 tasting. This month's focus was on the shining stars of 2013. And stars they were! There wasn't a wine in the bunch I didn't care for, but as with all things, there were several dazzlers. I started with Scott and his brand of wines, Brokenwood. He brought a lovely 100% Semillon that had brilliant acidity and a cirtusy tartness that had us all dreaming of oysters. "Voluptuous, round and somewhat smokin', this South African goddess dressed in classy French oak will have the world's palate salivating like Niagra Falls." And it totally merits all that drama. So yes, only 5 wines in and I found my favorite of the night; Kanonkop Pinotage 2010. I just loved this! A lot less smoky than the pinotages I've come across, this just had me wanted to grab the bottle and run. It reminded me of a young Bordeaux with its fruity/cassis flavors, and it left an amazing sticky cakey aftertaste. Asa! Chateauneuf du Pape 2009 from Gabriel Meffre. This was perfectly balanced, layered, light yet incredibly complex, it's no wonder this was the priciest of the evening's selections ($615). Walking out of the tasting I was feeling totally satisfied with past two hours spent among wonderful wines and wine enthusiasts (nice to meet you, Alex! 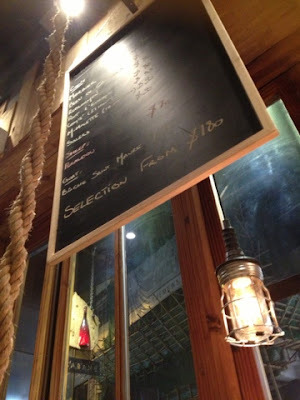 ), and then I was introduced to my favorite new place in HK; La Cabane. 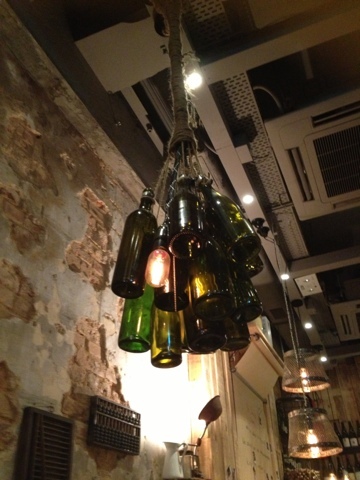 La Cabane is an incredible new wine bistro on Hollywood Road (62; they also have a retail wine shop down the street). You walk in to the narrow spot and immediately feel you're somewhere cool. One swing at each end of the bistro with unfinished wood tables in the interim, reused brick walls, empty wine bottle chandeliers, this place is meant for the hipster elite. We didn't know much about what the deal was, but Alban (GM) jumped right in with recommendations for one of their many natural French wines. For those of you less familiar, natural wines are chemical free, both in growing and process, and are unfined and unfiltered, sometimes leaving them with a cloudiness. Appearance aside, the wines we tried were superb and you could seriously taste the freshness. 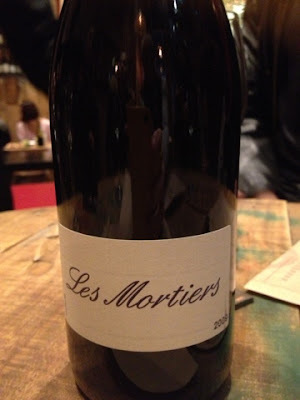 Of the two bottles we went through the Les Mortier 2009 was the favorite. Les Mortier 2009 Pineau d'Aunis Pepper!! Earth!! Tannin! This is inbetween a Cab Franc and Gamay. We all loved the rough uniqueness of it. Next time we're going in for dinner! Alban and his partners personally select all of the wines and food products they import into HK, and you can feel the passion in each sip. Get in there, but go early because place fills up. Seriously. Go now.